One Seaport Square construction is underway, bringing 832 new residential units to the area by summer 2017. The residential development is located in the heart of Boston’s Seaport District and consists of two towers, The Benjamin and VIA. The ground floors will bring 250,000 square feet of retail space including a Big Night Entertainment bar and nightclub, an Equinox gym, a movie theater, bowling alley and restaurants. Courthouse Square will connect the two towers and bring an open pedestrian plaza. Residents of One Seaport Square can enjoy beautiful views of the Boston skyline and Boston Harbor through the floor to ceiling windows that make up the outside of the buildings. Both buildings will have balconies and offer easy access to the Harborwalk, Fort Point and more. Other amenities within the development include, three levels of underground parking, units ranging from studios to three bedrooms and shared and private outdoor spaces. Both of the buildings have now been topped off and are expected to be complete by June of next year. One Seaport Square will qualify for LEED Silver sustainability certification based on its construction. Contact our advisors for more information about living at One Seaport Square or any other new developments around Boston. The Boston Redevelopment Authority has already approved six new development projects this month, totaling over one million square feet. Four of these six projects are residential and will bring new housing units to many areas around Boston. One of the largest scale projects to gain approval is the second phase of Waterside Place in Seaport. This development on the South Boston Waterfront has been a work in progress since 2007 and although it has been altered many times it will finally be adding on to the current development that opened there in 2014. The next phase will include 307 rental apartments across a 23 story building adjacent to the current development. Apartments will range from studio to three bedrooms, with 62 ‘innovation units.’ These units will be smaller than the rest, but benefits from the building’s communal amenities. Along with the residential development will be 3,500 square feet of retail space. As a part of the Massport property, Waterside Place benefits from great connections to public transportation with MBTA’s World Trade Center Silver Line stop right next door. South Station is also very close by. Construction is scheduled to begin at the beginning of 2017 and be complete by early 2019. Contact Advisors Living for more information on new developments around Boston. High-end dining options, gourmet food markets and more are coming to the Seaport as a part of new additions to the Fan Pier development. Four new residents will soon open in the area including: Mastro’s Ocean Club, Frank Anthony’s Gourmet Market, Sorelle and Salon Mario Russo. Mastro’s Ocean club is a seafood restaurant that will open in the Twenty Two Liberty Condo tower. Although this is the first of the brand in London, there are four others across the US. Frank Anthony’s Gourmet is the first food market to open in this area. Due to open later this summer, the owners hope to create a 21st-century corner market. Sorelle is already a well known bakery throughout Boston and will join the area at 100 Northern Avenue, also opening later this summer. Salon Mario Russo is reopening at Twenty Two Liberty, after their previous location in a temporary building closed. Twenty Two Liberty is one of the newest luxury developments in Fan Pier and with these new additions is becoming an even more sought after place to live. 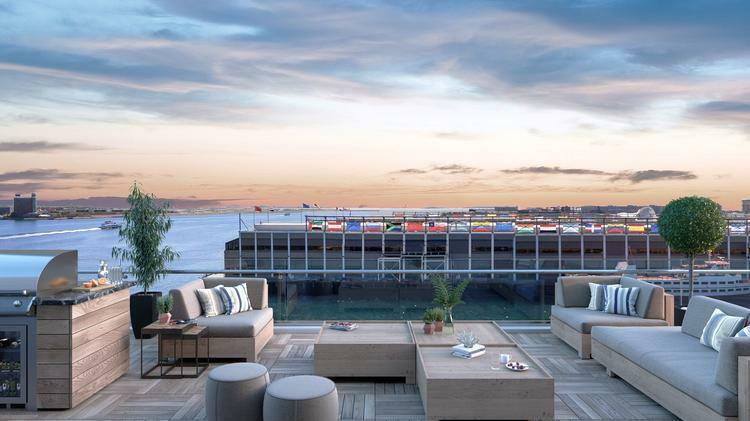 The combination of waterfront views, luxury amenities and all of these new additions make this an unbeatable location in the Seaport. For more information contact us at: contact@advisorsliving.com! Starbucks is a staple in most Boston neighborhoods, but two new possible openings are being very differently received. The first is in Seaport, where the brand is looking to open their sixth location in the area. Soon coffee lovers in the area will be able to visit the premium Starbucks location at 101 Seaport, as a part of the 17-story office building that is home to the headquarters of PwC. Opening this summer, this location will feature the brand’s reserve coffee blends that come from Starbucks’ flagship roasting home in Seattle. This Seaport location comes along with a huge amount of retail openings in that area and hasn’t received any negative feedback about the opening. In Southie, residents aren’t so excited about the idea of a Starbucks coming to their neighborhood. The plans for the chain coffee-shop to open at 749 East Broadway have already been denied once at the beginning of this month, due to residents disapproval and the fear that it would disrupt locally owned coffee shops in the area. Those behind the disapproval are also worried about the possibility of increased traffic at the already busy corner. Despite these concerns Starbucks is not giving up that easy and have already appealed the rejection, however it is not clear when the proposal will be reconsidered. A spokeswoman for Starbucks has voiced how this proposal can bring something to the community, yet most residents still don’t seem to be on board. What are your thoughts? Do you think Starbucks will hurt local coffee shops or is it something every neighborhood needs? Let us know!